You know you lived a day to its fullest when you create a memory, an experience, a feeling that will forever stay with you. 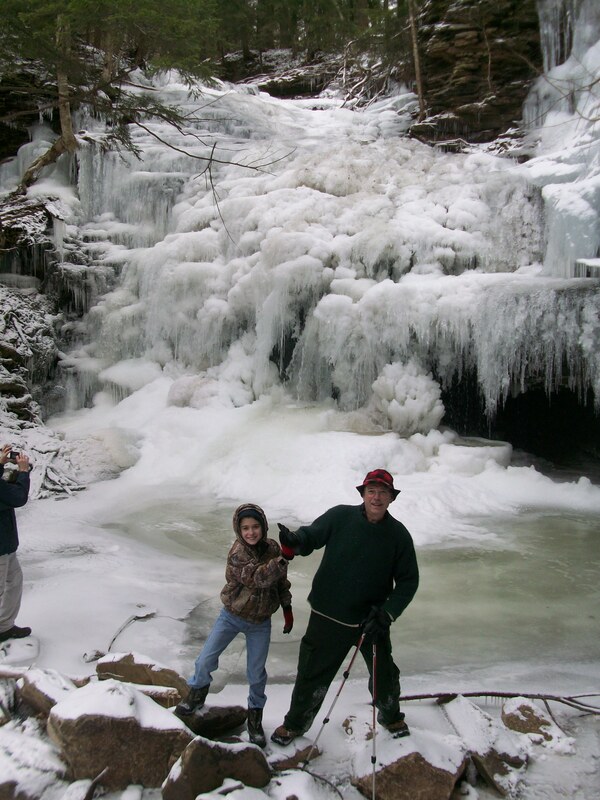 Over ten years ago I hiked up Scouten Brook in SGL 57. I was pleasantly surprised by the beauty of this stream, as the water slid over red bedrock and tumbled down small cascades under a hemlock forest. This off-trail hike was only the beginning for me, the first of many beautiful places I would see during my exploration of SGL 57. This past weekend, I returned. And it was amazing. I’ve spent little time in this area of the SGL 57. Recently, I’ve become intrigued by what might be there. Google Earth revealed a vast, deep green forest, even in winter. I suspected it might be a spruce and hemlock forest. Our plan was ambitious. Hike up Scouten Brook, explore the cliff rim of the spruce forest, find a vista, descend a side stream of Kasson Brook, visit Kasson Falls, and hike back out. This rugged hike would be about 17 miles. We followed an old grade along Scouten Brook as cascades danced far below over the deep red bedrock I remembered from years ago. Large boulders adorned the creek. The hemlock forest was not as verdant, dying from the woolly adelgid. The creek was beautiful and pristine as it flowed through a gorge of towering hardwood trees. Ryan mentioned there was a sidestream falls and iceflow across Scouten Brook. 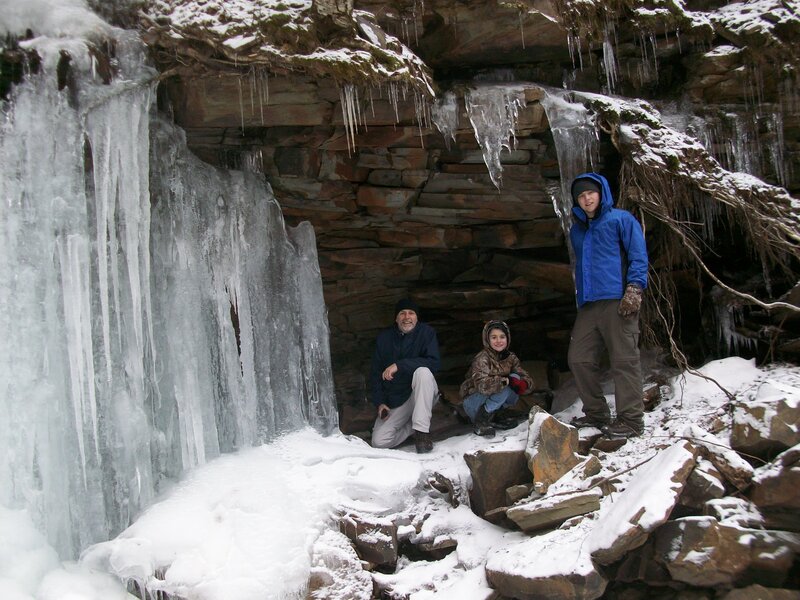 We scrambled up the steep glen and a grotto soon appeared with a 20 foot cascade and columns of melting ice. The day was warm under overcast skies and Ryan had to jump across the stream when an icicle suddenly collapsed. We continued up this rugged gorge, climbing over large boulders under towering old growth white pine and dead hemlocks. At the rim were jungles of mountain laurel and a cave formed by boulders that Wes explored. We continued along the rim, following a bear path, but the thick laurel made it slow going. 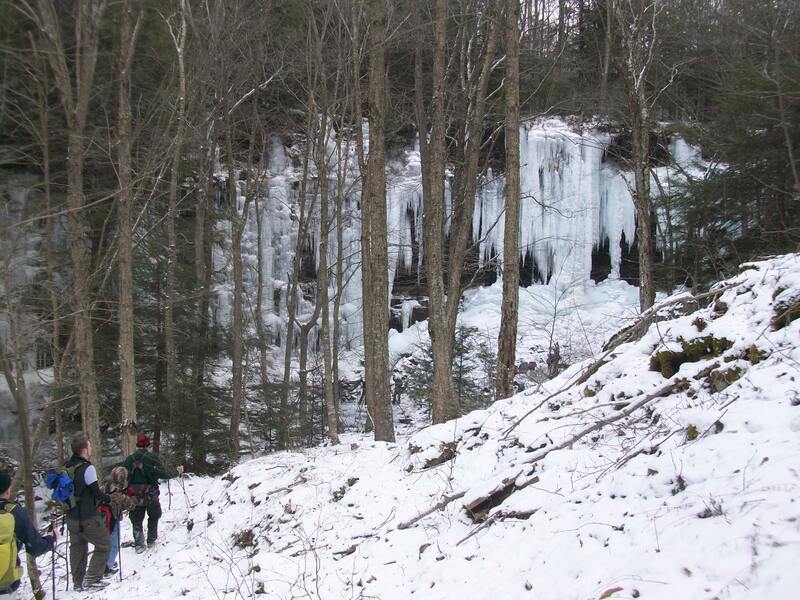 We descended steeply back to Scouten Brook to see a beautiful ice covered waterfall. Upstream were more waterfalls, all adorned with ice. It was a beautiful, serene place. Easier hiking was provided by an old forest grade that gradually climbed the plateau. The hemlock and spruce forest that was the goal of this hike soon came into view. We left the old grade and climbed to this evergreen forest and were greeted with a massive rock overhang with a cave behind it. The rock was made of pebbly conglomerate. I reached the overhang by descending through the cave, where one hanging rock looked like it was about to fall. We sat there to enjoy the scenery as spruce trees surrounded us. The best was yet to come. Incredible forests of spruce, hemlock, and moss. One of the most scenic forests in the state. We left the overhang and cave to the plateau rim to be immersed in an amazing forest of spruce, hemlock, and carpets of moss. It must be one of the most scenic forests in Pennsylvania. The greenery was simply incredible, invoking a forest from the Adirondacks or New England. Despite it being winter, when most forests are bare brown, this one was an endless green. We were awestruck. Carpets of moss spread through the forest, harboring countless spruce saplings. We could have been in the Pacific Northwest. Massive boulders comprised the forest floor, and in a few places, the separated boulders created long, straight chasms. Stunning. Moss and lichens covered the boulders. We pushed on through this sylvan wonderland. The cliff rim provided some views through the trees from the exposed boulders, as more caves and crevasses hid beneath our feet. The bedrock had separated, creating mazes of passageways and narrow, deep crevices that we had to be careful not to fall into. As we made our way around the western edge of the forest, the clouds cleared, offering deep, blue skies and warm sunshine. A strong westerly wind filled the spruce forest, as shafts of sunlight pierced the canopy to electrify the forest floor. It was a complete sense of wildness as the wonderful aroma of the spruce filled our lungs. Few people have ever seen this place. The rim featured more boulders and crevasses, and tangled, fallen spruce trees. We continued along the rim and soft carpets of moss. I saw a slight rise ahead of me and I climbed up to it. The spruce forest separated to reveal a beautiful view to the west, with vast plateaus, and the canyons of Mehoopany Creek, Stony Brook, and Red Brook. The view was untouched, with no sign of development. We were all impressed as we enjoyed the warm sun and blue skies. We knew we had found a special place. We weren’t the first ones here, but few have ever seen what we saw. I imagined what the sunset must look like from here, it must be beautiful, I thought. Views of the vast plateaus to the west, with no sign of development. We pulled away from the view, each of us burning it in our memories for a future return. Our hike continued on the southern edge of the “emerald” forest, the boulders were not as big, but it was scenic nonetheless. We found a tributary of Kasson Brook, and descended along it. The creek was filled with boulders and frozen cascades. As we descended, the creek became much steeper, with many slides and frozen waterfalls. It was too steep and icy for us to explore so we left the tributary and reached Kasson Brook. By this time we were exhausted. The climb up Kasson Brook was tiring, even with the fine scenery. We hiked over fallen trees and loose rock above a streambed torn from prior floods. The amazing iceflows of Kasson Falls came into view and I was speechless for a second. This grotto is truly impressive, and even with the warm weather, there was still a lot of ice. The ice had a bluish hue and descended like draperies. Springs tumbled from the edge of the grotto. The falls itself were frozen as well, next to an ice cave. Everything was dripping and melting. We were happy to see it before it collapsed or melted away. What is most beautiful about this stunning place is not the falls itself, but the surrounding springs that descend for the cliffs and freeze in winter. So much beauty in one place. The incredible ice flows of Kasson Falls. We hiked out to the road, passing more falls and pools along Kasson Brook. Twilight soon came as we flushed some wild turkeys from the pine and hemlock trees. The dark, bare tree branches reached across the last light of the day. The air was warm and still, making it feel like April and not January. Darkness surrounded us as we completed our hike on the road. The rapids of the Mehoopany Creek filled the isolated valley, the air had the scent of woodsmoke. An owl hooted in the distance. I slipped through the darkness, walking quickly along the road and startling deer in the woods. Constellations filled the clear sky, with Orion being the most vivid. We felt alive, seeing such a new and beautiful place, a place to which I must return. We lived this day to the fullest. Location of the Emerald Forest. The chasms are located approximately here (can’t see them through the trees). Sometimes it is the season that defines a place. While Kasson Falls is surely beautiful anytime of the year, it is in winter that its splendor is truly revealed. Hidden deep in a gorge, surrounded by mountains, Kasson Falls is a hidden wonderland. But it is not unknown, for even its isolation cannot keep its beauty a secret. The falls are located on private property near State Game Lands 57, however, the falls and its gorge are regularly visited. On a cold, overcast winter day as light flurries drifted in the fleeting sunshine, under patches of disappearing blue skies, we made our trek up Kasson Brook. The floods of two years ago still left their mark with massive trees embedded in the stream bed, and piles of cobbles pushed deep into the forest. It is hard to imagine a stream of this size could cause such damage. We hiked out of the valley and into the gorge, passing the collapsed remains of a schoolhouse and a small cemetery hidden in a grove of white pine trees. We left the old logging road and traversed off trail through the forest before descending back to the creek. There was once a dirt road along the creek that went to a cabin; it was obliterated. The beauty of Kasson Brook soon became apparent. The towering plateaus squeezed the gorge with ledges and talus. The creek was filled with boulders and cascades. The creek swept over smooth, sculpted bedrock into deep pools. A side stream cascaded from the side, next to a boulder sitting improbably upright on its end. My nephew Christian climbed the boulders and poked at the ice with sticks. Small waterfalls, waterslides, and boulders continued upstream. We had to cross the creek, tip-toeing on ice-covered rocks. The creek flowed over blood-red bedrock as snow dusted the bare forest floor. The terrain surrounding the creek forced us to cross again as cliffs blocked our way. One by one we crossed the surging creek, balancing on angled rocks. To the right was a deep side-gorge, carved by a tributary with non-stop waterfalls, dressed with gowns of ice. It begged to be explored. The creek continued to roar over rapids and ledges, constrained by grottos of bedrock. We had to take an old logging skid trail concealed by hemlocks on the south side of the gorge. We climbed higher and higher up the gorge. The incredibly steep terrain was impressive. Kasson Brook’s current filled the gorge with the sound of its rapids and falls. Forests of pine and hemlock covered the rim of the gorge. I looked across this chasm to the other side, to see another steep tributary plummeting down a ravine for hundreds of feet, completely covered in ice. Kasson Brook was barely visible through the trees; I could see the occasional boulder, pool, or cascade. Windmills were recently constructed on the tops of these mountains and several were visible from the trail, towering into the sky, standing silently. We could only imagine what the effect of the run-off and loss of hundreds of acres of forests in a place that was once vast and pristine would have on the streams like Kasson Brook. Even green energy comes at an environmental cost. In the end, the best solution is to use less. We turned off the skid trail and made our way back down to the creek. We picked our way down the gorge. And soon it came into view- the incredible grotto of Kasson Falls. Glacial blue ice flows covered the one side of the grotto. We were surprised to see several ice climbers there, setting ropes and practicing their craft in a stunning setting. A friendly dog greeted us as she tried to walk on the ice. The falls were completely frozen over; they are about 50 feet high and are a steep, curving cascade that drops into a pool. The ice formations at the bottom of the falls were impressive, with tubs of ice, filled with water. 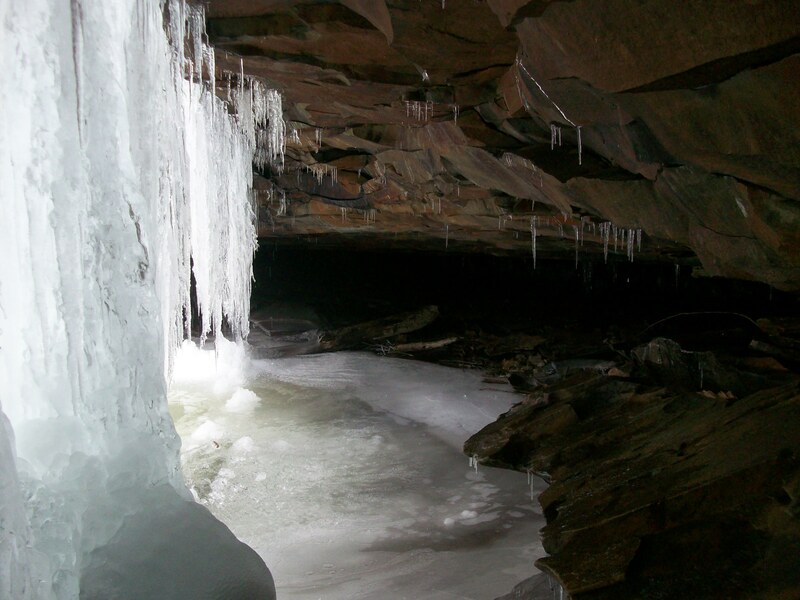 To the right of the falls were more ice flows that partially concealed a cave, a deep overhang, that was encased in ice. An amazing place. We stood there, taking it all in. Christian had grown a little frustrated from the long climb, but quickly decided to love the hike again as he explored the ice cave and marveled at the ice formations and falls. No video game could compete with Kasson Falls. Our time at this winter paradise had to come to an end and we began the much easier hike down the gorge, back to the cars, our lives enriched by what we had experienced. Whether privately or publicly owned, I hope places like Kasson Falls and Gorge will remain as they are for generations to come so that Christian will be able to share them with his children or grandchildren.